It can be very difficult to get around if you suffer a mobility related problem, such as arthritis, which can make it painful to bend your knees and walk for an extended period of time. This means going to the zoo is probably out of the question and even things like grocery shopping can become very difficult or even impossible. Many people who have trouble walking use mobility scooters to restore their freedom and mobility. A mobility scooter is a vehicle that is designed to carry a single seated individual and in many cases their belongings. They can be used be used in both indoor and outdoor situations. 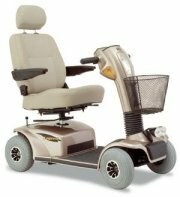 They are very similar to motorized wheelchairs, but usually the person sits upright in the middle of the scooter and uses a set if handlebars to control the unit. Modern mobility scooters are battery powered and can be charged by plugging the scooter into a normal electrical outlet. 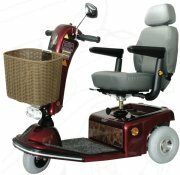 There are many different types of mobility scooters that have different features and are designed to be used in different situations. They are basically divided into two categories. 3-Wheeled Mobility Scooters These types of mobility scooters have 2 wheels in the rear and 1 wheel in the front. This allows for them to have a very small turning radius. They are great for using in the home and other that have tight quarters. Since they only have 1 wheel in the front, the weight of a 3-wheeled scooter is not evenly distributed. This slightly reduces their stability and also affects the amount of weight they can support. The reduced stability is not dramatic, but they will not preform as well over rougher outdoor terrain. 4-Wheeled Mobility Scooter This type of mobility scooter provides a much more stable base, because the weight is distributed evenly between the front and the back. This makes them superior for outdoor use and able to support more weight. Heavy duty mobility scooters, which are designed to be used over rough outdoor terrain, usually use a 4-wheel configuration because it is more stable, but a few models use a 3-wheeled design with an improved suspension. A 4-wheeled mobility scooter will be slightly heavier then a 3-wheeled scooter and it also has a larger turning radius. This slightly reduces their maneuverability in tight quarters.